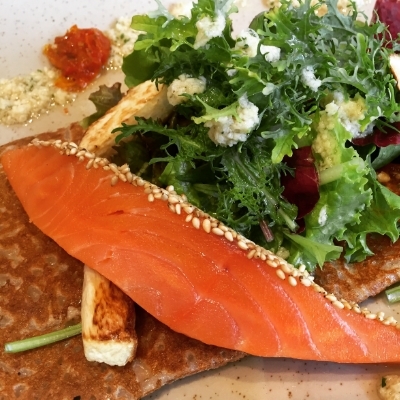 The Breizh Cafe chain of crêperies first introduced authentic 100% buckwheat galettes to Japan a couple of decades ago and those at its Le Comptoir outpost are our favourite. Especially when washed down with Brittany brut cidres or the delicious Eddu Silver buckwheat whisky (a rareity in Japan, apparently). Besides the menu of surprisingly filling savoury dishes, monthly specials and a focus on seasonal ingredients sourced from various regions of Japan and beyond bring a depth to the dining experience not usually found at most other crêperies we've tried. Particular favourites have been the Scottish smoked salmon with turnip and cheese galette, and the Miyagi pork sausage galette with radish and mashed potato. For the sweeter of tooth, the salted butter caramel crepe is worth a visit too.